As a marketer, taking note of the social networks demographics breakdown is crucial as it will help you to adjust your social marketing strategy for each social network you are planning to hit. This is critically important especially when you understand the different users that typically each social network attracts. Getting the right message to the right audience at the right time is beneficial. Successful social media marketers take their message where their audience is. 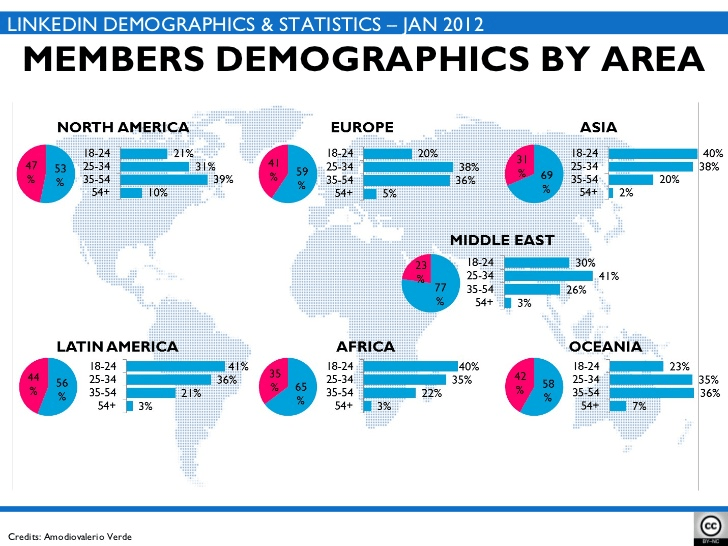 Of more importance to note is that demographics do change from day to day in social media networks. Targeting new audiences is not a complex task but understanding the latest statistics on social media demographics could be helpful. Each brand has its own exceptional audiences that come from a different location at different age groups, gender, education, and income. In our post, we will help you get the latest data about the user demographics of every major social media platform. Most of the sources are from a study by the Pew Research Center on social media use. First things first, to be able to tailor your message to the right audience, you must find your audience on social media. You might be selling a great product and your services are top-notch, but your message will be dead unless it is directed to the right audience. Regardless of whether your content is engaging on not, if you want them to get engaged you must find out who they are and take your products and services where they are. 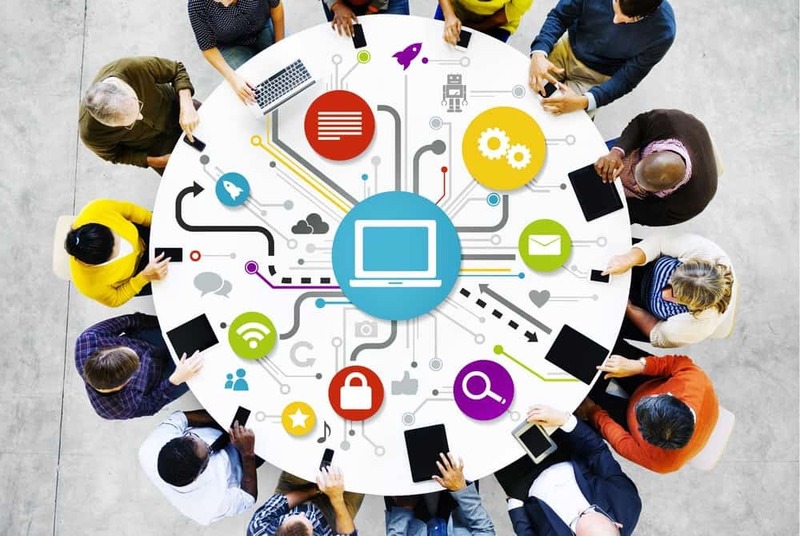 If you are struggling to connect with your target audience on social media platforms, it means you do not know where they hand out online. In this article, we will help you find out how to find out your target audience on social media. Before you go out to look for your audience, you must recognize them. You need to ask yourself; who are my target customers? What is their age group? What is their income? Do they exhibit common values? Answering the above questions and many others can give you a picture of your target customers. Also, if you are a social media expert helping small, medium and large businesses with social media services, you must ensure they can find out their ideal customers. When it comes to the platforms, you need to find out if you are investing in the appropriate network. When creating content for social media marketing, you must ensure your content is tailored to the right audience through the right channel where your audiences spend most of their time. Note that you will have to do some research here. 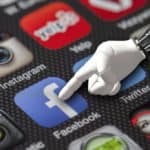 When it comes to social networks, you must find out where your ideal customers are hanging out most of their time on different social media networks. Let’s find out from the major social networks. According to recent social networks demographics breakdown, Facebook has and is still the most commonly used social network, with 1.45 billion daily active users. When we consider this channel based on total population, more than 68 percent of US adults have Facebook accounts. Here, you can rest assured that you can rely on this channel but you must observe the latest Facebook marketing tips. Content marketing has changed so you must ensure you are up-to-date with the latest trend in social media marketing. 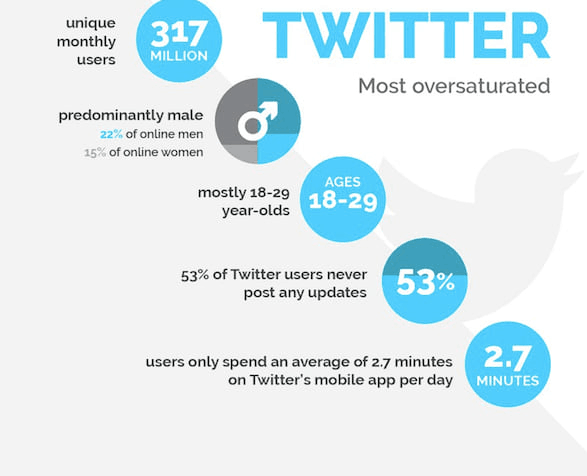 Twitter has a monthly has about 330 million active users and 73 percent are in the US, with more than 36% of online users being adults in the age range of 18-29. Instagram has more than 800 million users with daily active users about 500 million and more than 300 million users visit the platform daily. Which social media network do you prefer? Do you read the blog frequently? 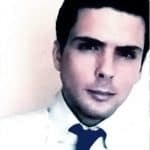 What are your favorite blogs? What caliber of social media users do you connect with mostly? 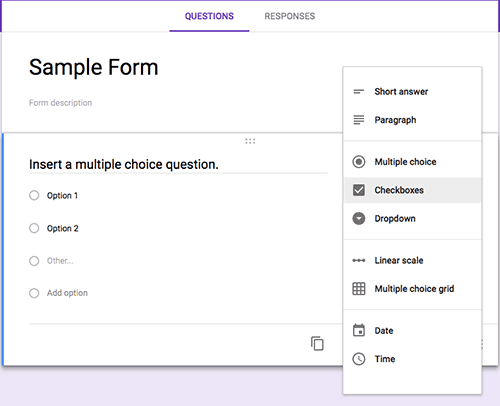 You can use Google Forms to gather your answers. Now that you have identified your target audience and connected with them, you can start determining and tailoring your content to them. You should note that every type of content works best for a specific audience as well as some social media channels. Since you cannot start a business without knowing who to sell your products and services to, the same applies to Facebook strategy. The clear the picture you have of the people who are in your Facebook community, the simpler it becomes to create and share content that will help them. 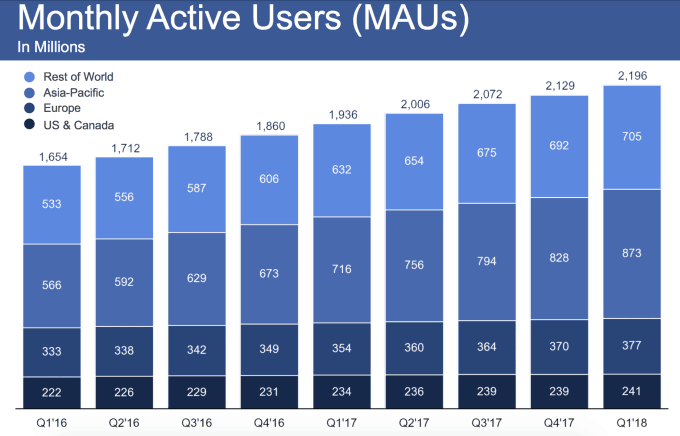 With the latest study showing that the number of Facebook users who access Facebook per day is increasing at a 16% rate every year with mobile usage growing by 21% every year. This is a clear indication that Facebook users are going anywhere. Understanding social network demographics breakdown, especially Facebook demographics, will aid you and enable you to meet your customer needs by tailoring content on the channels appropriately. They give you a clear picture of who you should target who are key to your business. Help you to find out the content that works best for your ideal customers as well as the content that is not helpful to them. Let’s find out the Facebook demographics, statistics, and data that is key to your business. 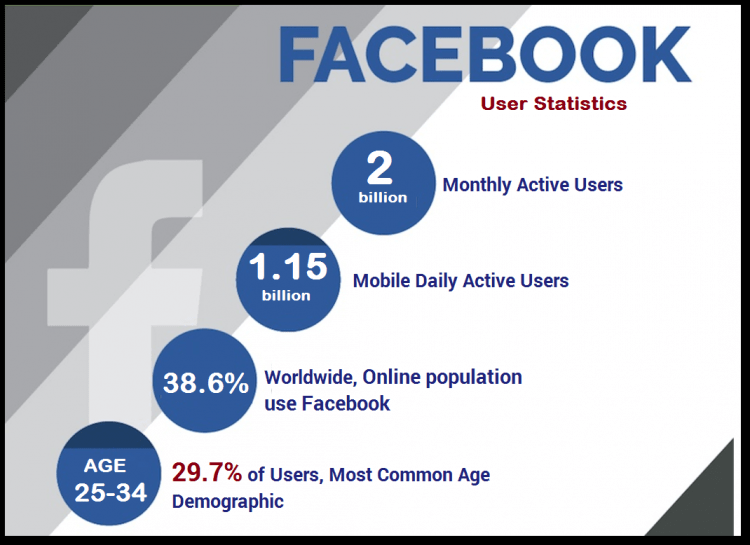 Facebook is currently the leading social media network with an average of 1.45 billion daily active users. This is a clear indication that you can depend on Facebook to enhance your online presence. Any information that you get about to your target audience as well as the current users engaging in your content, is helpful to fine-tune your content appropriately and boost your personal interaction. The greatest demographic on Facebook, those at the age of 25-34 is also the right target demographic for most internet marketers. This statistic shows that your brand will have a greater audience on Facebook. Having a clear picture of the age of your target demographic can contribute greatly on how you tailor your content. The picture painted in the statistic is a clear indication that the content your tailor to those in the age of 18-29, should be different from the one you intend to deliver to the age of 45 and up. The most important thing here is to identify who you are speaking to so that you are aware of how you can connect with them. Just like age and gender, understanding the Facebook demographics about your audience education level could be helpful when it comes to identifying who they are. Initially, Facebook was launched for university students and this is the main reason why university graduates take the lead in education demographics. When targeting your ideal audience, it is crucial to understand the education levels of various users within your target bracket. Having a clear picture of the income for your Facebook target customers is also very helpful. 84 percent of old people who earn less than $30,000 are on Facebook. 80 percent of grown-up people earning $30,000–$49,999 are on Facebook. 75 percent of older people earning above $75,000 are on Facebook. 77 percent of users who are on Facebook are earning $50,000-$74,999. 81 percent of adults on Facebook live in the town centers. 81 percent of adults on Facebook come from rural areas. 77 percent of adults on Facebook originate from the suburban. From recent social networks demographics breakdown findings, Instagram statistics as of now shows that it has more than 600 million active users. This has made this photo and video sharing app to be at the top of the news headlines. It is believed that of these million users, more than 59% read Instagram stories every day with more than 35% of them accessing the app multiple times per day. 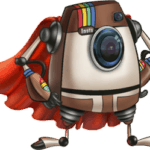 After its launch in 2010, Instagram is seen to be a favorite social network for image storytellers worldwide, in fact, with the introduction of Instagram advertising, this app has become more than a socializing site for businesses. Understanding your Instagram demographics can be helpful as it can help you with ideas on how you utilize this booming social network. The data presented here originates from the Pew social media report. 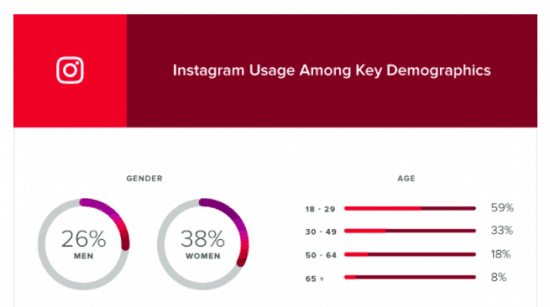 Instagram demographics show that men and women of the younger generation find Instagram to be a go-to way to share videos and pictures with their fans. 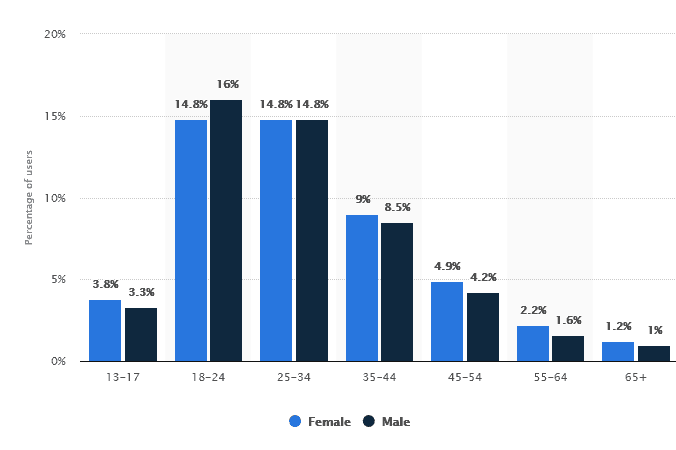 According to a survey by statista as at April 2018, it was noted that 14.8% of worldwide active Instagram users were ladies aged between 18 to 24 years. 8.5 % of men in the age of 35-44 years are on Instagram. 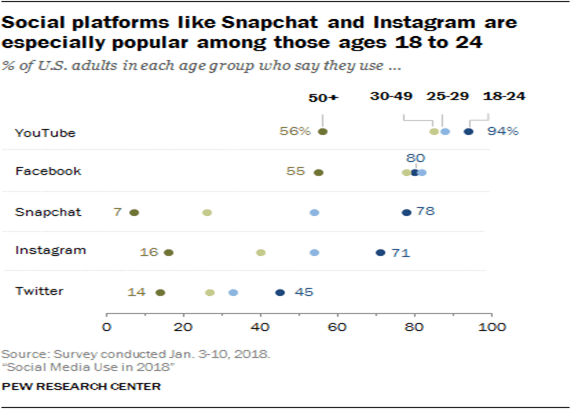 The survey shows 42% of adults in the US who are in college use the Instagram photo and video sharing app. 29 of adults with high school grade or less are on Instagram. Instagram provides superb exciting advertising and multi-photo and video options to help your customers have a view of your product and services from multiple angles. This is a fantastic way to stress the value of your products and services. However, it is good to identify your target demographic appropriately. 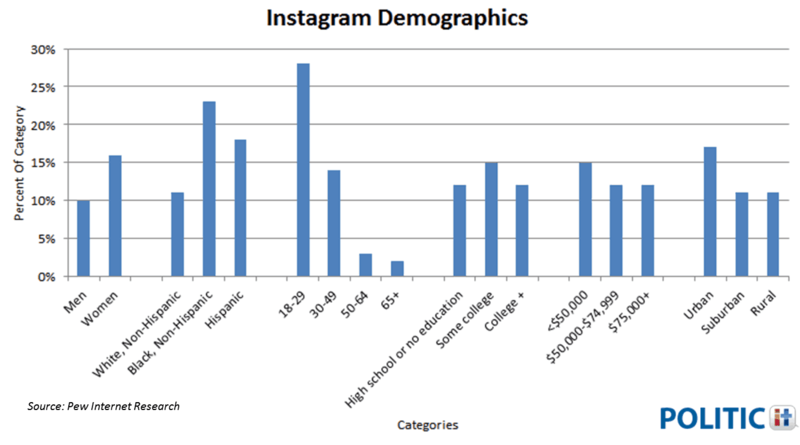 38% of the age above the binary earning below $30,000 use Instagram. If you want to reach out to Instagram users, consider looking in the big cities. However, users in the rural and suburban are starting to see a rise. The Phew Study found that 39% of the users on the age above the binary living in urban cities are on Instagram, 31% of users on the age above the binary living in rural areas have Instagram accounts and 28% of adults who live in suburban areas are on Instagram. While you might think Instagram users in the city might have more content to capture, rural and suburban users are on the rise. But like most location demographics around young age groups, the city spotlight still gleams. 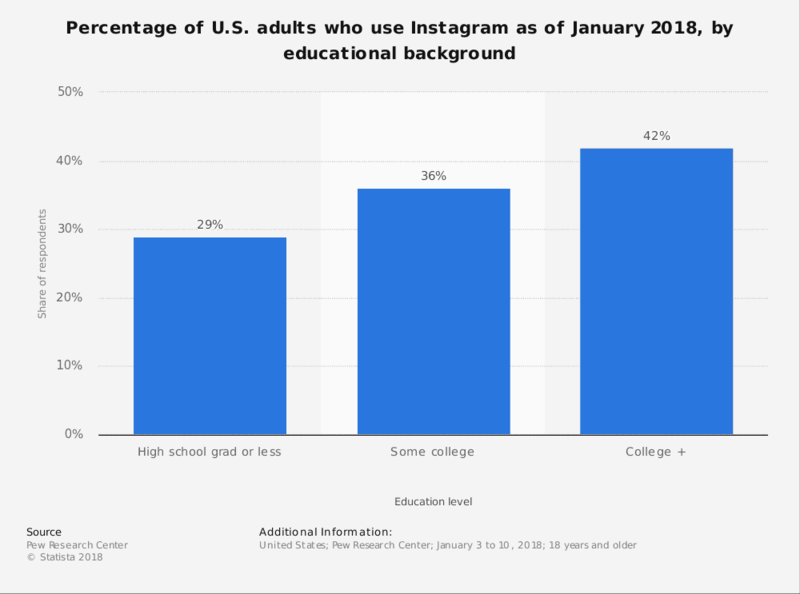 This demographic data indicates that your business has an audience on Instagram and can take your marketing strategy to greater heights by scheduling content and managing your Instagram online presence via Hootsuite. You can use the free plan then advance to the premium at a later time. There are 330 million monthly active users on Twitter. This shows that this channel is becoming more popular for businesses, agencies, and enterprise organization. International companies leverage Twitter’s ability to reach globally that enables companies to advertise their upcoming products worldwide. Twitter use is growing tremendously and gives users opportunities to distribute content rapidly. Marketers, businesses, and companies can make professional connections and get the current news around the world. 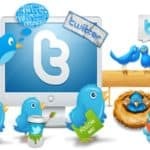 There has been a narrative that young generation is abandoning the ancient social platforms for new and upcoming ones, however, a survey shows that they are and still will be using the Twitter platform. 10% of those above 65 years old use Twitter. The Pew study has shown that 25% of internet users on Twitter are women and 24% are men. This survey shows that businesses targeting the younger generation have an audience on Twitter. 24% of Twitter users who live in rural areas are adults. As seen above that Twitter’s age demographics are a majority of people in the younger generation, Twitter education demographics should come with no surprise that it is veered towards users with college experience. 20% of adult Twitter users have a high school diploma or less. 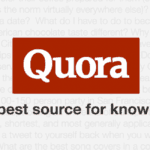 Above $75,000 make 30% of Twitter users. 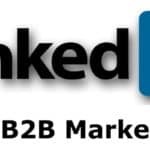 LinkedIn is a powerful social network for professionals; however, this platform shows a lot of insights into target audience. Recruiters looking for prospective candidates, content creators looking to publish content as well as marketers wanting to reach their target audience will find this social network to be the best. Marketers should educate themselves about the LinkedIn demographics before implementing a social strategy. 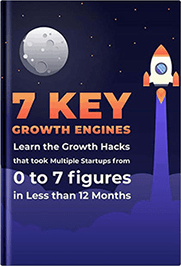 This is to help you avoid investing their time and resources into a platform that can’t help to achieve the intended goals. LinkedIn has more than 562 million registered members in over 200 countries worldwide according to the LinkedIn’s About Page. 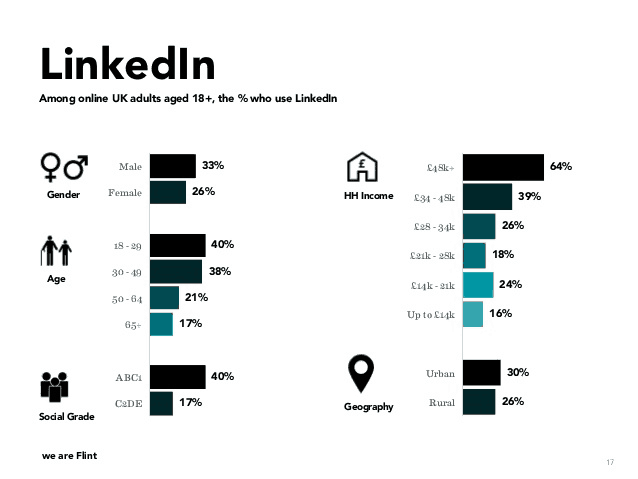 LinkedIn shows no discrimination when it comes to gender of users, however, there more males than female LinkedIn users. 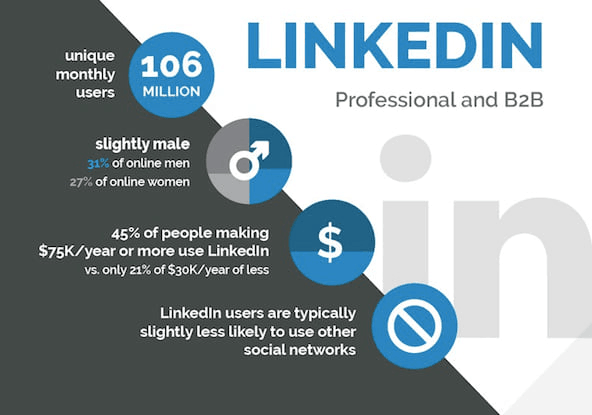 According to the Pew report, LinkedIn’s male users are 31% and 27% are female users. Although age is just a number, it can have a significant impact on your target audience. People of different ages have diverse buying needs so you have to identify the age group that is most likely to buy from you. 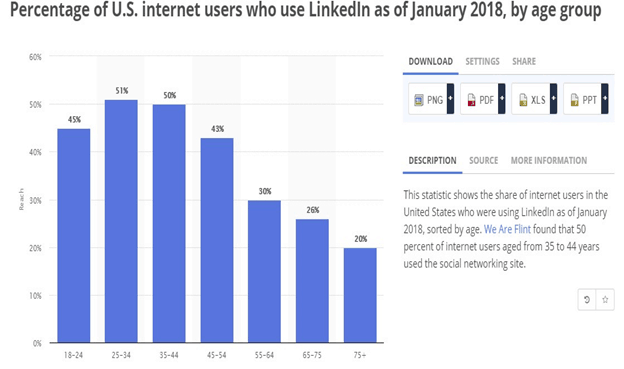 20% of LinkedIn users are older people above 75 years. LinkedIn is perhaps the network that most educated people find it preferable. 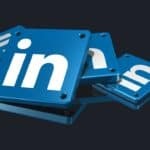 The Pew report shows that there are more employed adults; about 35% who are members of LinkedIn than those who are not employed; about 17%. Marketers looking for an audience on LinkedIn need to target users beyond the US. LinkedIn has users in over 200 countries and 70% of the users come from outside US. Education demographics have been constant for many years since the platform is mostly dominated by professionals. However, there is still more insights to gathers from this platform. 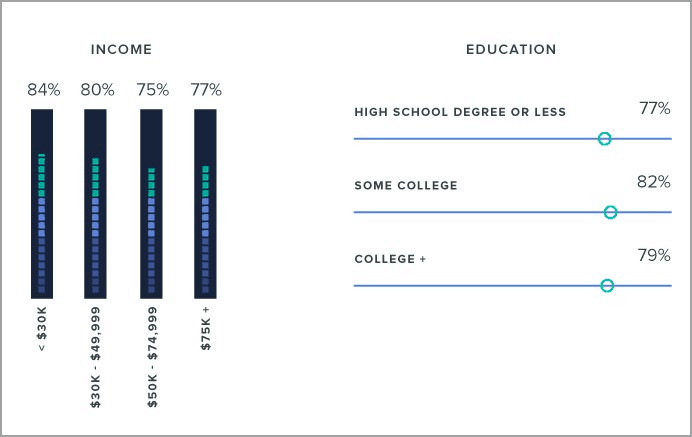 Those with some college experience make 27% and 12% aged above the binary are high school diploma holders. Snapchat is also a picture and video messaging app like Instagram. This platform was designed by students from Stanford University in 2011 and allows users to record and send pictures which are known as snaps. 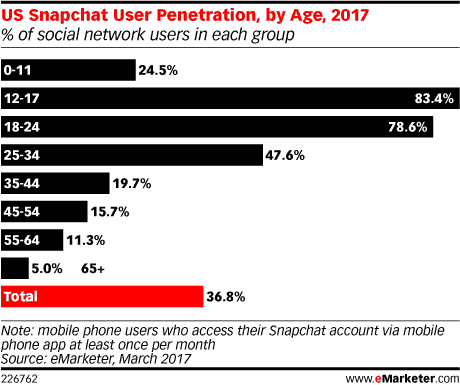 Users under the age of 25 years access Snapchat for approximately 40 minutes daily. Snapchat monthly active users amount to 300 and above with more than 187 million daily active users globally. Pinterest is among the rising social media platforms for businesses and brands who want to maximize their online presence on the social media landscape. With 175 million users where a small percentage is from the US and a bigger percentage from outside US, Pinterest is becoming a bonafide social media star. Pinterest boasts 40% new members who are men and 60% new signup who are women. 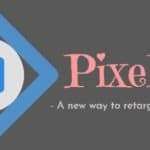 If you have not considered this platform as one of the rising star in the social media world, then you should get motivated from the Pinterest demographics data. 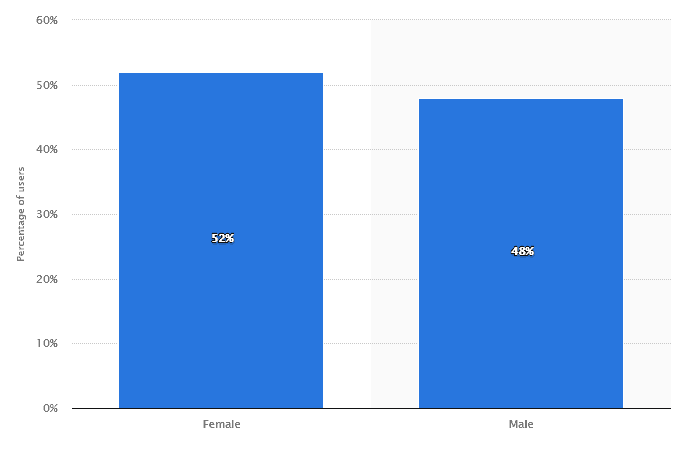 As from the Pinterest newsroom, the platform has 40% of new signup who are men and 60% are women. This shows that Pinterest is still very much popular to women than men. 28% of adults between 50-64 years and those at the age of 65 and above who are members of Pinterest make 16%. According to the Pew Research Center, Pinterest boast a bigger percentage of those earning more than $75,000. 32% of users make $30,000-49,000 per year and adult Pinterest users earn more than $75,000 per year. Marketers must be able to find out where those people who use Pinterest live. Most possible, they live in urban centers, but let’s find out from the Pew social media report. Having this demographic data in mind, you are more likely to get more Pinterest audience from suburban areas than in rural areas and this is where you can direct you Pinterest marketing. 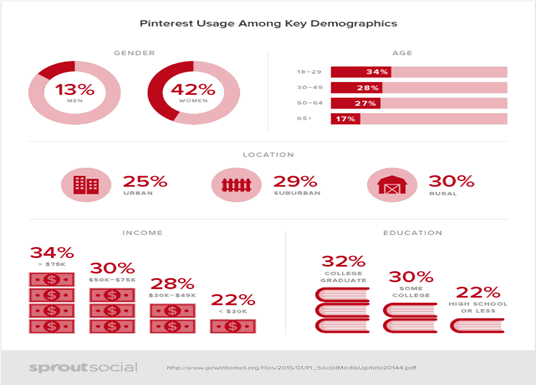 When it comes to education demographics, Pinterest users are slightly the same as on other social networks. YouTube has and is still the web’s start network when it comes to online video-sharing. 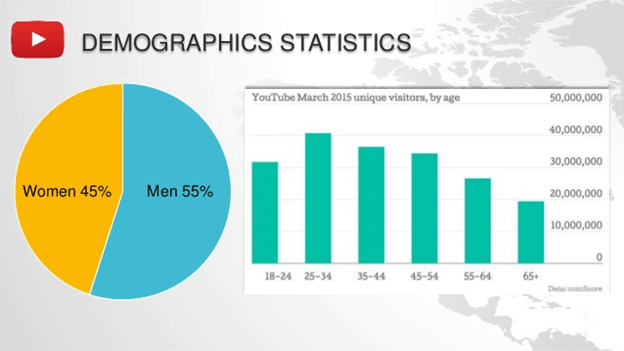 YouTube is currently the most recognized video sharing platform boasting the widest and diverse audience worldwide. Brands looking to reach new audiences and target niche demographics will find YouTube as the valuable advertising destination. Let’s find out who make YouTube a valuable advertising destination for marketers. 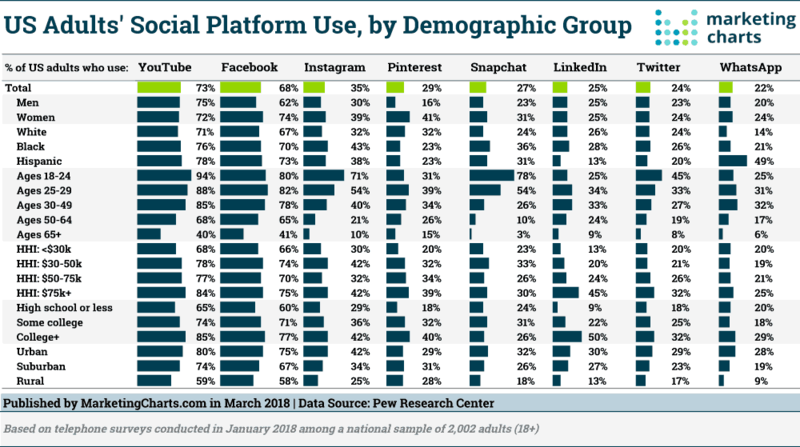 The social networks demographics breakdown above show that marketers and business owners have a great audience on social media, however, Facebook takes the lead being the most popular used channel followed by the image and video sharing app; Instagram. 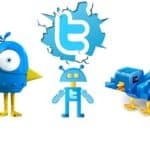 Twitter on the other has shown a good number of users who are at the college level having an interest in this platform. 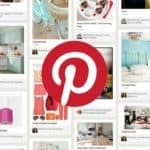 Pinterest is also among the rising social media platforms for businesses and brands who want to maximize their online presence on the social media landscape. YouTube on the other hand has and is still the web’s start network when it comes to online video-sharing. Note that it is good to ensure you understand where your audiences are what they are doing at that time. 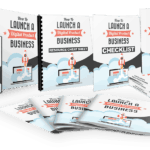 This will help you while crafting your social media marketing strategy.